How do I associate a site member to my family tree? In order to understand the meaning of association, you should be aware that there is a difference between the members of your Family Site and the individuals in your tree. You can invite your family members to join your site and become your site members without adding them to the family tree, or add family members to the tree without having them as your site members. 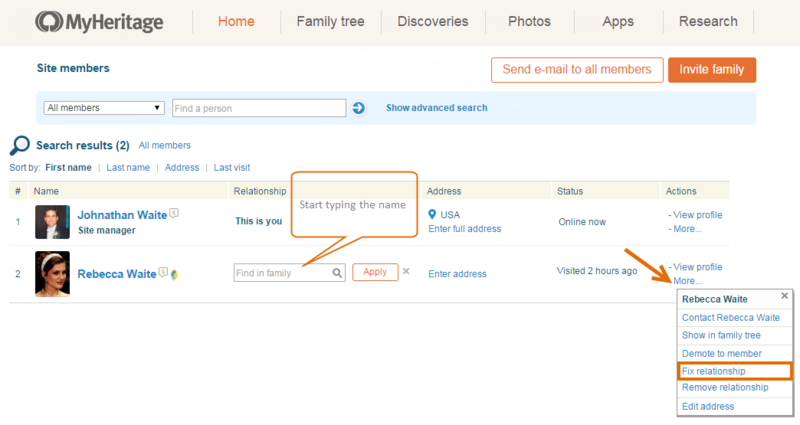 On MyHeritage family sites we calculate the relationship between a person who is viewing the site and other site members and family members in the tree. But in order to identify the relationship correctly, it’s necessary that the site member will be associated with the correct individual in the family tree. We recommend to associate all site members with the family tree, so that we can understand their relationships to other individuals in the tree and display them correctly. 1. Log in to MyHeritage. 2. Click on your name in the upper right corner of the screen and select ‘My Sites’. 3. 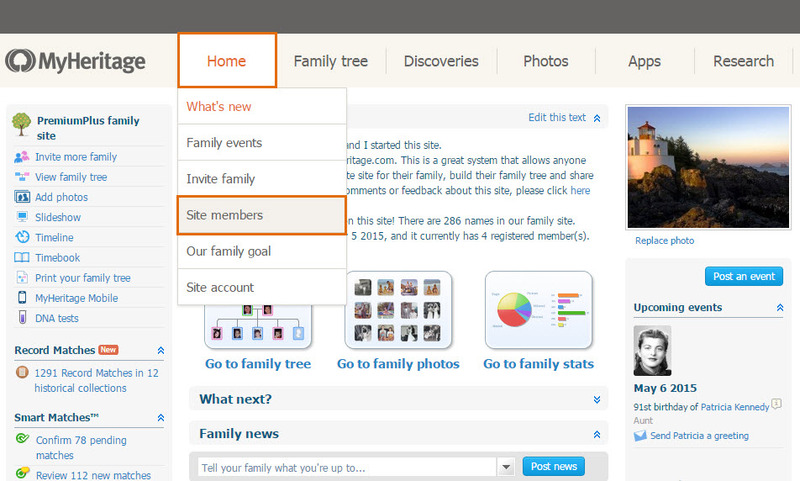 Choose the relevant Family Site from the list and click on it. 4. Move your mouse over the ‘Home’ tab and click on ‘Site Members’. 5. Next to the member’s name you will see the empty field where you should enter the name to find the corresponding person in the tree. 6. NOTE: If the member has already been associated, and you would like to correct the association, click on the ‘More’ link on the right side and select ‘Fix relationship’. Then you will see the empty field next to the member’s name. 7. Start typing the name in the same way it shows in the tree, in the empty field. 8. Select the correct variant from the pop-up that appears. Repeat the same actions for each site member, including yourself you're still not associated to your tree.